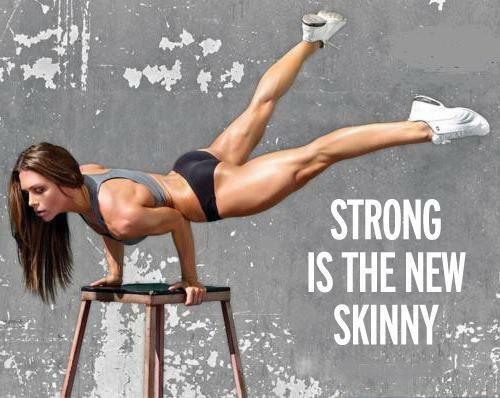 Strong is the new skinny. You’ve seen the pictures: beautiful women with perfectly sculpted abs and derrières, looking pensive while striking incredibly athletic poses. As a naturally athletic body type, I love the slogan and the ads. It’s great for girls, who aren’t naturally rail thin like the models they see in the magazines, to have a healthy body type to emulate. I always like to play devil’s advocate, though, and my concern now is for those girls who are genetically slender. I know it must be hard for the CrossFitting waif to see the “Strong is the New Skinny” slogan all over Facebook and Twitterverse. I know a few women who desperately want to gain weight and have self-esteem issues related to their thinness. My question is: Can we all just be happy with the bodies God gave us? As long as you eat clean and exercise daily your body will look the way God intended. You may look strong. You may look skinny. As long as you’re living right, you will be beautiful! While I agree/appreciate the argument you’re making about endorsing any one body type over another, I think the slogan itself is wonderful. “Strong” does not have to be synonymous with “think and athletic appearance.” Strength doesn’t even have to be a purely physical thing, as you pointed out in response to Lisa. What I’d love to see is this slogan used with photos of not-so-athletic-looking women doing amazing things. Shannon, I love the idea of the slogan being used for other things: cancer survivor baring her beautiful baldness, a woman escaping the hold of an abusive relationship, a mom giving birth, the list goes on and on. Great idea!!! Then why can’t your slogan read: live strong eat right and show real models in various stages of their fit development…. why does it have to be the “new beautiful”. What concerns me is I am strong, I lift my 130lb daughter from her wheelchair several times a day.. my legs are rock solid, my arms are firm, I am strong and I try to eat right but I look NOTHING like them slender toned girls in those pictures… so does that mean I am not beautiful? To be honest I do love the photo and your add is beautiful but in the same breath your add is just as bad as those airbrushed models in Vogue giving off a false sense of what everyone who is beautiful should look like. I look at that and look at myself and think if that is what God intended as beautiful then He left me out of that loop. Lisa, thank you for your comment. Being a caregiver is extremely difficult, but incredibly rewarding at the same time. I used to have to do wheelchair transfers for the five years leading up to my mom’s passing. There is no doubt that you possess both physical and emotional strength.